So can you guess what my news is?! 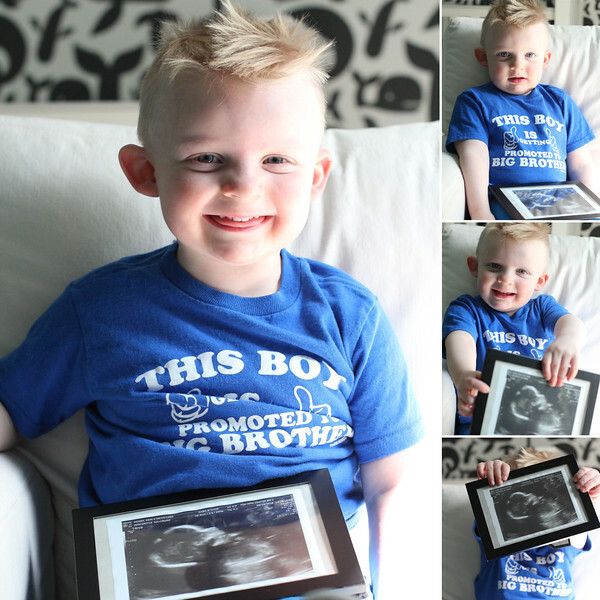 We are having another baby….and it’s a GIRL!!! The little one is due to arrive this October and we are so excited! Big Brother Wesley included – see below! 😉 Of course I’m really looking forward to decorating a little girl’s room. Chris and I had so much fun working on Wesley’s room together and can’t wait to tackle a new space. We don’t have an extra bedroom right now so we need to move things around first, but right now this nursery above designed by Caden Lane has the peaceful and pretty vibe I’m hoping to achieve. I really love the pastel wall color, Sherwin-Williams “Embellished Blue” SW 6749, and how they paired it with coral and gold! So many great DIY projects and budget-friendly ideas here too. You can read all about it and see more photos here! Congratulations! I can't wait to see what you come up with for your nursery! Great news! That nursery is awesome! Congratulations! This nursery is so adorable. I love the little touch of handpainted flowers on the wall by the baby's gold name. I can't wait to see what you come up with! The room is darling and so is the announcement! Congratulations ! I love reading your blog each day! Thank you for all that you do to make it all so special. ???????????????? What thrilling news! Congratulations! And save up–it's way too fun to shop for girl things! WOW, congratulations! That is so exciting! I have two girls and it is so much fun! (though I wish I had a boy too!) I am in love with the nursery above. I love the gold in with all the soft colors. So pretty! CONGRATULATIONS, Erin, Chris, and Wesley! What a wonderful addition to the family, a little girl! And look how proud Wesley looks already! He's just adorable holding baby girl's first pictures. This nursery is very cute. I love the color scheme, and though I'm more a fan of silver than gold, and loving the gold accents. That mirror is gorgeous, and that crib looks fit for a princess. Can't wait to meet the new bambina in October! Congratulations! I can't wait to see your beautiful design for her room :). As soon as I saw the title, I just had a feeling that was what your news was going to be! So exciting! Congratulations! Wesley looks like he is up for the job! He's growing into quite the little man! What exciting news! So happy for you and your family! Congratulations! I was wondering about those pictures of a girl room… till I read your news. Congratulations. Hope you are feeling well and healthy.